Build your own Stormtrooper fantasy wearable space armor from high density (HDPE) plastic rain barrels. The armor created is suitable for Halloween, costume parties, science fiction conventions etc. Beginning with a 55-gallon HDPE ("high density polyethylene") plastic barrel (of the type often used as rainwater collection barrels,) I will show you how to create rugged wearable chest armor. Suitable for costumes, science fiction/fantasy conventions or role-playing, these are wearable and durable. From this basic how-to do it yourself tutorial you can extrapolate other designs and concepts as will be demonstrated in images at the end of this series of articles. What Can We Make From This Rain barrel? Here below is an example of a 'space theme' character chest armor that I made a few years ago for a friend in Hamilton, Ontario CANADA, using a 55-gallon chemical barrel just like the one shown here. The assembled sky blue armor is spray-painted with primer then with bone-white spray paint, but can receive any color the wearer desires. The buckles on each side unsnap and the chest cage expands several inches on a spring-like resistance, similar to the way a clam shell opens. The wearer can comfortably and easily crawl up inside of this and re-attach the snaps for a adjustable snug fit. The snap-locks are a very effective, rugged system and the chest armor is surprisingly comfortable to wear. The material actually seems to draw body heat away from the wearer. So, -are you excited yet? Are you ready to learn some basics how to build armor like this and more? Let's begin! Procure One or Two 55-gallon Barrels - But from Where? Typically, these are 55-gallon chemical barrels are non-deposit because they are non-refillable. Food-grade products such as phosphoric acid (usually white barrels for food-grade) are what we're after here. "Food grade” barrels cannot be reliably cleaned of potentially dangerous contents and by law, are non-refillable. Black barrels are usually for industrial-grade chemicals such as concentrated phosphoric acid typically used for rust removal, and for even harsher chemicals. Special care is needed to thoroughly rinse these barrels before use in our costuming project. 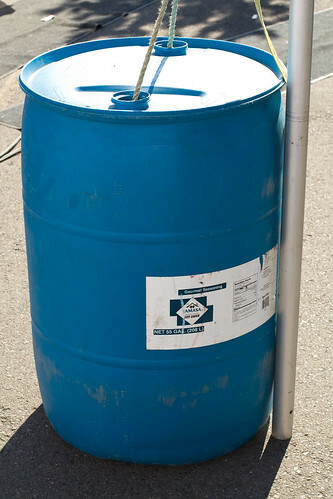 Blue barrels are usually slated for 'cleaning agent/alkaline products,' such as bulk ammonia-based cleansers for commercial use. Again, use these highly-caustic barrels suitable for use only after thoroughly rinsing them inside-out with water. The black barrels being non-food grade products are refillable and thus, typically incur a distributor's deposit of at least $55.00. Removing these barrels from a facility, if allowed, requires that you pay the deposit. We'll just work with the FREE white or blue barrels for now. You can also buy any of these new & unused barrels (in an assortment of different colors) for around $55.00-$75.00 each, or more. A quick search the internet (Google "55-gallon plastic barrels for sale") and you will be rewarded with dozens of sites that sell and ship barrels to you the buyer, in quantities that will suit your needs. I got mine for free at a dairy-foods manufacturer. Any consumer foods facility (bakery, meat-packing, dairy foods, etc.) uses products delivered in these barrels. Usually FREE for the asking, you are doing them a favor by asking to take these. Some 'yard and farm' stores may even have a short renewable supply of these for industrial farm use even if they are not prominently displayed on the sales floor. Any boat marina probably uses 55-gallon barrels for their floating docks. Ask yourself, -ask them: where did they get them? I have heard this over and over again, "I looked, I really did, -but I can't find any barrels!" and seriously, I don't believe them. Sure, maybe the first acquisition is a little difficult but after that, it is just another barrel. Once you 'find' or 'acquire' one or two and get to know the source of these chemical barrels, it gets easier and easier to acquire them. You will start to see these barrels everywhere! At any one time in the late '90s and early 2000s I had a rotating stockpile of over 35 of these barrels in my back yard! THIRTY FIVE! That is not including the dozen+ that I had stored at my dad's barn and the several dozen or more that over the course of a year I had previously given away to friends with farms, given horse enthusiasts for their rodeo events, etc. I even swapped two 55-gallon barrels to a family-owned pizzeria (they wanted these for garbage collection out back) for two free slices of pepperoni pizza! The barrels were FREE for me so I profited by the cost of two slices of pizza and the investment of several minutes of my time. Every time I brought home one or two more barrels I would give away an equal number that I had previously amassed, thus maintaining my inventory for my crafts and for emergency requests. At the behest of my landlord to 'clean-up my backyard,' I sold all the barrels I had for $5.00 each to a private garbage collection company. They use these barrels for recyclables separation (glass, plastics, small white metals, etc.) for their rural-route customers and told me that they would take as many more of these as I could get. They were buying them elsewhere at auction (new, I assume?) in lots for upwards of $30.00 each, so my price of $5.00 each was a serious savings for them. Enough of procurement. Let's now assume that you have a barrel or two. Let's begin with making a reusable template. Using one of your T-shirts as in Figure A, lay it upon large WHITE poster-board card stock. I stress 'white' because once I used black card stock for a ‘black’ armor I was making and I really missed the convenience of being able to leave pencil notes and remarks directly upon the card stock. Notes like "front" or “back”, "inside/outside," "left arm” or “right arm" and more specific details like “add 1-inch here” or “trim this,” and to do math calculations, etc. Trust me, take the easy shortcut suggestions. Sketch the basic design you see in Figure B above, with generous ‘excess’ tails which will be trimmed away later. This is your basic template design shown below. Cut this template with scissors, and save it for re-use. Lay this template (above-right) onto the barrel lengthwise (repeat, “lengthwise”) as this will aid in forming the general ‘shape’ of your torso. You are going to be wearing this so anything to help with the proper fit / intended shape should be considered. Trace the design onto the barrel using a ‘Sharpie’ magic marker. You want to trace TWO of these templates for the front and back of your armor. Using a portable electric jigsaw, cut out the two templates. Because we sketched this template to have excess material, a cut-on-the-lines exactness is not a big concern. Using a serrated steak knife like a draw-shave, peel away the pebbly edges where the saw made the cut. This will help to keep your work area cleaner as these pebbly beads will slough off on their own and they get into everything; your clothes, your rug, furniture, your hair, etc. Work cleanly and smartly else you (or your wife) will be finding these pebblies in the washing machine, in the clothes dryer, in the sink, the bathroom carpet, etc. all because they were attached to your work clothes. Examine this image, notice that your shoulders slope slightly ‘downwards’ and your midriff slopes slightly ‘narrower’ towards your hips. The next step will need to incorporate these slopes in the bends that we are about to make. I used the bath tub filled with COLD water, but any large container of water that is large enough to fully and conveniently immerse the armor is suitable. Be aware that this is plastic and that you are using a propane torch. HDPE plastic emits noxious and potentially dangerous-to-breathe fumes when super-heated, so ventilation is required. Working outdoors when use the torch and plastics is best. The template pieces, I call them “carapaces” at this juncture, have a soft marbled exterior texture and a glass-smooth interior surface. Which side do you want to be the exterior of your armor? Either is okay, but I prefer the exterior surface of the barrel as the exterior of my armor, but I have done it both ways. Avoid over-heating any one section too intensely or too rapidly. You want the plastic to be pliable, soft but not so hot that it appears ‘shiny’ and begins to bubble-up and melt. If the plastic becomes shiny or clear-opaque, almost see-through, it is over-heated. Stop! Move the torch away and do NOT touch that area. Allow the temperature to dissipate on its own; it will quickly spread to the surrounding area and the plastic will return to a usable state. Do NOT touch the plastic with your fingers or any tool to ‘test’ the softness. The plastic will be very hot, very tacky and if touched by bare skin it will adhere; you will receive an intense and nasty burn. HDPE plastic retains heat very well so there is no hurry to perform any of this. Speed cause mistakes. Slow and precise is the key! You can heat the plastic slowly over several minutes with this method and still be within desirable workability. In fact, waiting a minute might even-out the hot-spots and make the bend-site more homogeneous. There is no rush to get to the bend, hold and water-cool step. When the corner that you are working on is hot and pliable, almost limp and very flexible, turn the propane torch off and allow the heat within the plastic to propagate evenly. Gently bend the plastic to form the general shape, angle and contour of your shoulder, noting which is the left versus the right shoulder and in relation to the exterior/interior surface of the carapace. You want the 'marbled texture' of the barrel to be the exterior surface. Holding the bendable extension securely in the desired position, slowly immerse the entire carapace into the cold water as shown in the image above. The plastic will harden immediately, often with an audible gurgle of steam. A ‘tap’ or ‘jerk’ will often be felt directly in your hands as well. This is okay and very desirable. It means that the ‘memory’ of the plastic has been successfully re-written. If you must apply any notable force at all to bending the hot plastic it is not hot enough. It should bend similarly to say, the flat cardboard of a pizza box or nasal tissue box. If you note that there is not a ‘gurgle’ and/or ‘snap’ feel when dipped in the cold water, the plastic may over time slowly relax back to its former shape. The ‘memory’ was not fully rewritten. For some bends that will be riveted or bolted into position, this can be acceptable but for most bends you really want to re-write the plastic’s memory. Do the four bends on each of the two carapaces each in turn, noting that they will mate to each other to form a single unit with excesses to be trimmed away later. Do not be concerned that the complimentary sections of carapace #1 and #2 may not line-up exactly perfect. They only need to be close. There will be ample opportunity to trim any excess or overlapping material later. So pat yourself on the back. You have learned a lot today. It has got to be Beer-thirty somewhere so let's take a break from this tutorial. I will resume in Part 2 (and link these articles together) and we will examine assembling these two halves, fitting for comfort and symmetry, and what comes next. PART II of "How to Build Wearable Fantasy/Sci-Fi Armor" is now available. Few images of each step were taken, and even those that were are not as revealing as you might think. Remember, a photograph is a picture of a 3-dimensional object which must be rendered back into 2-D ("blueprint") for tracing. And, when I built these I had no photos to base my work upon, so I drew-up each part as-needed. The sketches are really more helpful than any image could be. And these sketches provide ample room for 'trimming' overages and overlapping. Trial-&-error, I must have sacrificed a dozen or more barrels before I 'got it right' and from the sketchy blueprints, I have since made another half-dozen such creations are each one required 'trimming' away surplus around the edges once bent and fitted to the intended wearer... -I wish I could hold an 'internet class' and actually show IRL how these are made! ;-) That would be kewl! Maybe I should make a YouTube video? -Encouragement?? This whole series is a terrific gift to all of us. The knowledge I have gained here will save me untold hours and resources as well as pulled out hair. Well done and easy to understand. My only suggestion would be to show some photos along the way. The sketches are informative but sometimes a photo helps to. ...and looks cool. Thanks again for all the work you put into this tute. ...how do you link the articles together as mentioned in this one?" Using the hyperlink tool in the online-editor toolbar. Or I can code it manually (I am a web page builder.) I have the second article about half completed already (only got started this afternoon with it... many distractions over the weekend...) Gosh, -I really should do videos for YouTube eh? That would make it so much easier to show..
That's great! It sounds as though you have worked out the methods and have examples to share. I am looking forward to part two of this article. btw, how do you link the articles together as mentioned in this one? I made two STAR WARS 'Stormtrooper' armor using these materials, several 'fantasy' armor and then took-on making StarGate: SG:1 'Jaffa Serpent Guard' armor (complete with removable head.) The first Jaffa Armor took me just over three years to build working off & on and I learned 100s of 'short-cuts' and next, made a second Jaffa armor that was scaled about 1/3 smaller for a friend and complete that one in just under one month... Having worked-out the blue-prints and methods for assembly.. Yes please do! As I stated, my son (six years old) is working on a suit of armor and would like to finish it before Halloween. He is determined to be a knight and is quite the little "Boffer" fighter. He really wants a "Hard-suit" in the worst way. He (mostly) drew the pattern, and I cut it out for him about two weeks ago. He wanted to use the skill saw but I wouldn't let him. It is gratifying to see him working on it, learning how to use the file to take off the rough edges etc. Now he needs to know what parts go where... It looks pretty cool. Maybe I'll make one for myself and wear it when we go to the renaissance fair with him next spring. Thanks for your help! If there is interest, I could add a sequel. Will the next installment be done soon? It has been nearly a year. My son would like to finish his armor before this Halloween. I'm working on the next installment, Assembly of the Carapaces. That is very cool and very well instructed too.